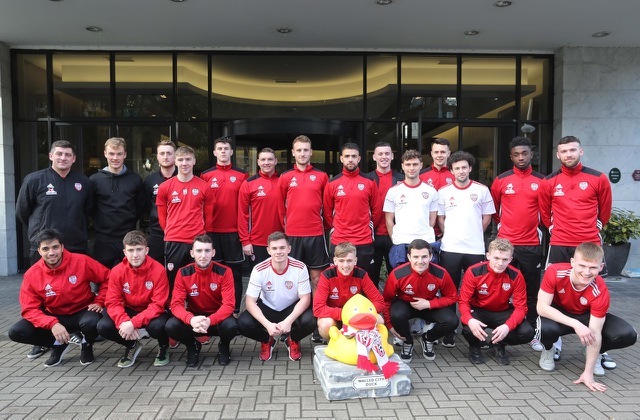 Derry City enjoyed a winning first weekend in the Premier Division against UCD on Friday night and players and management were rewarded with an invitation from the Everglades Hotel to join them for carvery lunch last Sunday. The timing couldn’t have been better for Declan Devine and his staff given that the club’s under-17’s we’re playing Vancouver White Caps at the Brandywell later in the afternoon. “It was a chance to relax for a few hours after a very busy time for everyone” said the City manager. Having completed the walled city tour a week earlier, the players were introduced to another tradition here- meeting the Walled City Duck. This ‘professional fowl’ is displayed at the hotel gate bedecked in red and white for every Candystripes’ game and is hoping for plenty of quack following Devine’s men throughout the 2019 season.